Having trouble finding the right tree for your home? 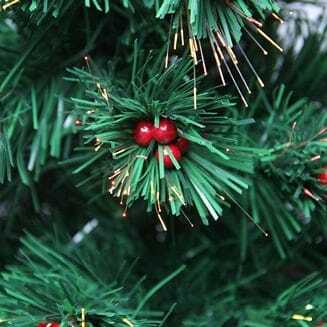 When deciding on an artificial tree, there are many things to consider. Is a real or an artificial tree best for you? What size tree do you want? What type of tree material do you prefer? Below, we will help you answer these questions to help you decide which tree is right for you. You can’t start decorating for the holidays without making sure you have the perfect Christmas tree. One of the decisions to make is whether to buy a real tree or an artificial Christmas tree. 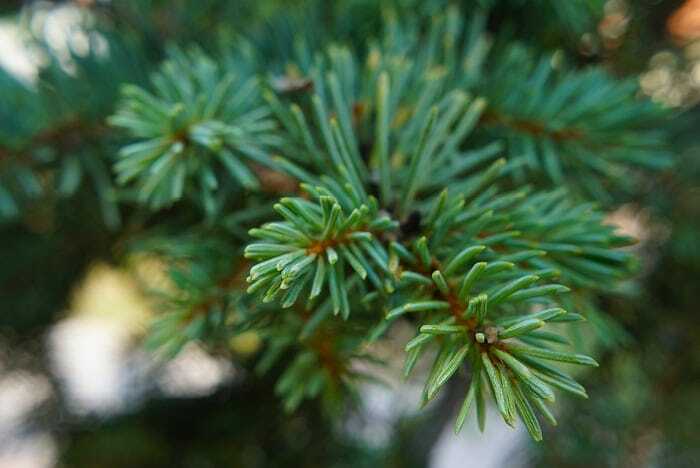 Real Christmas trees are biodegradable and have the convenience of easy setup and teardown. Because they are only good for one season, they do not require storage space and sometimes cost less than an artificial tree. However, some tree farms will spray their trees with pesticides. 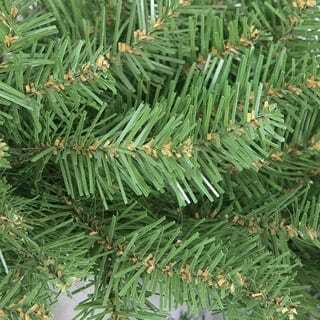 Real trees also need to be watered, and have a tendency to shed their pine needles. If you decide to purchase a real Christmas tree, you should cut the stump of the tree about half an inch (1⁄2) or so and set it in cool water immediately. A fresh-cut tree will absorb several quarts of water right from the start, so it’s important to check and refill the water level several times a day for the first week. You can cut down on frequency later. Be sure to place your Christmas tree in a stand that has a large water reservoir and keep it filled. 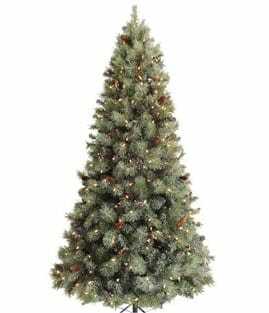 Check out our expansive line of Christmas tree stands to find the right one for you. They are much easier to decorate. They do not attract insects or other pests. They have a fuller, more luxurious look. They last for years and often come with a warranty, saving you money. They can be conveniently delivered to your door. They can be set up earlier and left up longer for a longer holiday period. They don’t have to be watered or maintained. Once the holiday season is over, you can just pack it up and store it until next year. Assembly is easy. One person can set up the whole tree in minutes. Here at Christmas Central, we only deal with the largest Christmas tree companies that sell the most realistic, high-quality artificial Christmas trees in the world. If you’re looking for a simpler decorating experience, pre-lit trees may be the right choice for you. Pre-lit Christmas trees come equipped with evenly-spaced light strands, saving you time and effort in the decorating process. On the other hand, you may wish to determine the exact light setup for your own tree without any preset options. Many of the trees at Christmas Central are available both unlit and pre-lit. When deciding on a tree, you want to make sure that you keep in mind the space that you wish to put the tree in. A typical tree ranges from 18 inches to 12 feet in height. The taller the tree, the wider its base must be. People who live with limited space may prefer a short tree, or a narrow pencil profile tree, a wall tree, or even an upside down tree. We recommend having at least 9" - 12" of space between the top of your tree and your ceiling. Living in an apartment or looking for a space-saving tree? Pencil and Slim trees have a small width and take up much less space. Is space not a concern? View our Medium and Full Profile trees. Do you have soaring ceilings and a wide open room for your tree or are you a business looking to decorate for the season? View our oversized commercial trees. What Tree Profile is Best? Are you wondering which tree profile is right for you? Take a look at the height/width ratios below to determine whether a Full, Medium, Slim or Pencil profile Christmas tree is best. A full profile Christmas tree has a height/width ratio of 1.5 or lower, meaning your tree will be 1.5 times as tall as it is wide. For example a 7.5’ tall tree will have a base diameter of 5’ or more. A medium profile Christmas tree has a height/width ratio of 1.5 to 2, meaning your tree will be 1.5 to 2 times as tall as it is wide. For example a 7.5’ tall tree will have a base diameter of under 5’ and greater than 3.75’. A slim profile Christmas tree has a height/width ratio of 2 to 2.5, meaning your tree will be 2 to 2.5 times as tall as it is wide. For example a 7.5’ tall tree will have a base diameter of under 3.75’ and greater than 3’. A pencil profile Christmas tree has a height/width ratio of 2.5 and up, meaning your tree will be at least 2.5’ times as tall as it is wide. For example a 7.5’ tall tree will have a base diameter of under 3.75’. Our artificial trees are, for the most part, made of different types of plastic polymer. The most common types are made of one of two materials: Polyvinyl chloride (PVC), and polyethylene (PE). Our other artificial foliage, such as garlands, swags, and wreaths, also have the same materials. PVC (polyvinyl chloride) is the more common material, having been used in artificial trees for many years. The branches are made out of plastic which is cut into very thin and narrow strips that prickle to the touch. Its many thin strips and cheap production costs make for a very full and affordable artificial tree. PE (polyethylene) trees are made to a more exacting standard. They are a molded plastic cast in the shape of actual pine needles. They have a more realistic look and a slightly rigid structure. Most trees with PE branches also include PVC branches used further back to give the tree the fullest possible look. 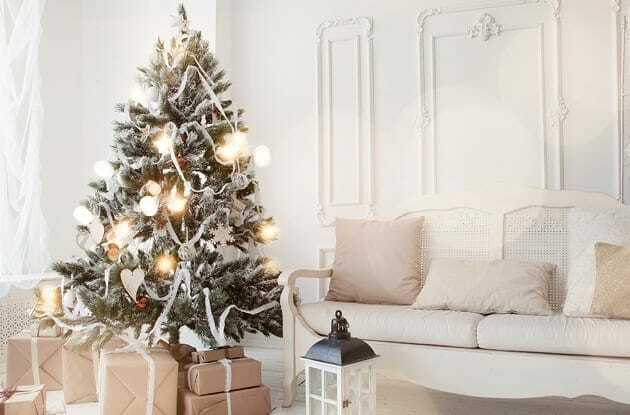 There are pros and cons to both types of trees, but what is indisputable is that either artificial tree style will give your Christmas the traditional, wonderful feel that it needs, while being a resilient and reusable product to stay in the family for years to come. The best part of buying an artificial tree...the options! But we know it can be overwhelming so we've put together a guide for our most popular tree brands. Are you looking to add more of a personal touch for the holiday season? Our colorful trees are a great base for that special themed-tree or to serve a specific room in the house. 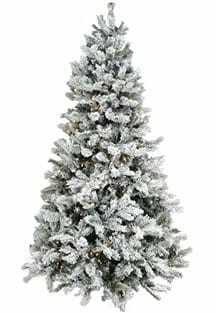 Our flocked and frosted trees are great to bring the outdoors inside this season and make for a great base to showcase your sentimental ornaments. We also carry many potted trees, alpine trees and specialty trees. The purpose of frosting or flocking is to imitate a tree covered in snowfall. This effect can add drama and flair, and is often employed to create a decorative scene. The tree looks as if pulled right from a wooded glen, still freshly covered with the snow that was on it when it was found. Frosted: The tips of frosted tree branches gradually turn white at the edge, giving the green tree a subtle white fringe. The tree appears to have been touched by a strong frost, leaving a thin layer of ice on the branches. Flocked: A flocked tree, on the other hand, is covered with a white fibrous material which is sprayed on the branches to imitate actual snow. The material is clearly visible, coating the tips and branches of the tree with artificial snow. Flocking, unlike frosting, is a bit looser and can crumble off with movement or handling. Although the effect is striking, flocked trees are prone to yellowing over the years. To help prevent this, store them in a dry, cool environment. Sometimes someone may want a full-sized Christmas tree but they don’t have the space available. For people with limited space, wall trees are a great solution. Wall trees are a special type of Christmas tree that is flat on one side. Taken as a whole, it simply resembles a normal-sized tree, cut down the middle. The idea is to place the tree flush against the wall, which will give the impression that it is growing out of the wall. Some of the trees have stands meant to lean flat against the wall, while others have no stand and are meant to hang from hooks or nails. 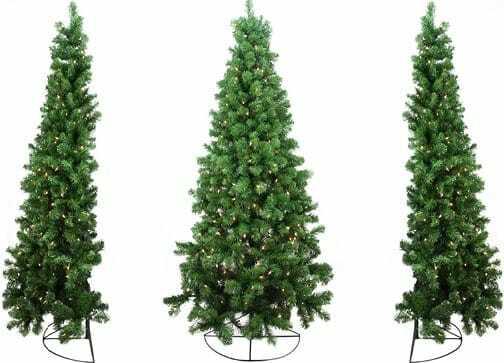 These trees are made of the same materials that make up most of the standard artificial trees sold, but take up only half the space, since they don’t require clearance for a full 360 degree arc. 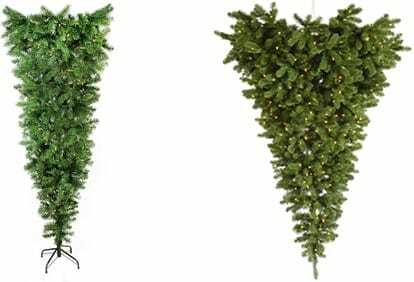 If you need a tree that will fit in a smaller space, or you’re just looking to break from the traditional tree concept, you may want to take a look at upside down trees. The bottom of these trees are actually the narrowest part, placing the flared out section high up where it does not interfere as much with floor space. Some of these trees can even be hung from walls or ceilings. They are a great tree choice to free up floor space and are great conversation starters. If you’re looking to add a pop of color to your holiday decor this year, a colorful Christmas tree may be the right choice for you. Instead of going with the traditional green Christmas tree, you can choose from a variety of tree colors including red, purple, blue, white, and more. Most Christmas trees are lit in the same way: strings of light bulbs wrap around the tree, hanging on its branches, and glow from within. But there are a few different styles, the most recognizable of which is the fiber optic tree. Fiber optic trees provoke a certain retro feeling. Fiber optics is a type of material that transfers light from one end to another. Therefore, the fiber optic tree works by having a central large bulb that transmits the light to all the tips of the tree, causing them to glow. Usually, the bulb has a color wheel that changes the coloring of the light in a regular pattern, changing the glow of the tree needles as well. 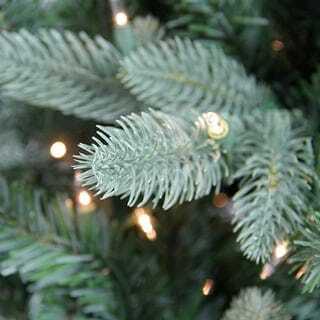 Fiber optic trees are popular in store fronts and displays, since they have a tendency to be somewhat smaller than normal Christmas trees, but larger versions of this tree are available as well.